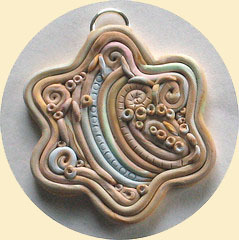 Polymer Clay Central has announced the August 2007 Challenge theme: Filigree. "Filigree - originally, a jewelry technique when an intricate design is formed using metal wire. Polymer clay filigree is formed by strings of clay applied in coils or freeform shapes onto polymer clay or other surface to create a textured design." "A lazy susan mechanism really helps make the rope spirals." Mail your entries in by August 15, 2007, for a chance to win one of three prizes. Good luck! Hrmmm I've seen some beautiful filigree work online, and tried a little bit of it. I didn't do to well, but I'm sure practice makes perfect. If I ahve time, perhaps I'll have to try to enter the contest. I'm honored that you choose my pendant for your picture! Thank you for the recognition. Filigree is probably my most favorite thing to do with polymer clay, I find it very relaxing and expressive. You're welcome, Phyl. I had seen your comments on Flickr about how you found filigree relaxing -- and that really intrigued me. Most of the other comments I saw were people complaining about the intricate work involved... but I love geometric things, so I think I might enjoy it too. I bought me a Makins clay extruder yesterday, so I'm gonna do some playing & see how it goes!